Whether or not jobs will be lost due to the greatly increasing trend of manufacturers, and retailers, to use more and more robotic systems to perform assembly and other production duties remains to be seen for certain. In my opinion, the less jobs available, the less people have the finances to purchase robotic-manufactured products and goods, and so the less money and product demand these companies will experience. They will lose sales. They will lose profits. So this thereby defeats the main purpose they implemented these robots in the first place - to make more money! In other words, things will balance out over time. Supply and demand rules economics. However, I totally digress from my above words if robots start assembling other robots, become super intelligent AI beings, and then find no need for humans at all - a.k.a. Terminator! And well, actually, that's pretty much what Fanuc is doing already - their robots are assembling, and instructing, other robots. Fanuc is a super-secretive company with its main headquarters located in Japan, not far from Mt Fuji. The original company behind Fanuc is Fujitsu Ltd, since Fanuc is actually a subsidiary of Fujitsu Ltd. With the help of engineer Seiuemon Inaba starting in 1955, Fanuc, an acronym for Fuji Automatic Numerical Control was eventually founded in 1958 and then well established by 1972. The main purpose behind Fanuc's creation was to produce numerical control operations (with punch cards) for machine tools, like lathes, presses, and milling machines, but then the main focus eventually evolved into computer programmable instructions, and then robotics. But things really got going for Fanuc in 2010, when Apple implemented the use of Fanuc's Robodrill for machining the all-metal casing for the iPhone 4. Since then, with all the subsequent versions of iPhones these past years, especially with the recent iPhone 8 and the iPhone X, Fanuc has accumulated even more sales and become far more profitible, as more Robodrills are purchased and used for iPhone manufacturing, especially in China. Which only keeps contributing to Fanuc's growth and robotic ventures. Of late, in 2016, Fanuc introduced Field, Fanuc Intelligent Edge Link and Drive. This is an open, cloud-based platform that allows Fanuc to "collect global manufacturing data in real time on a previously unimaginable scale and funnel it to self-teaching robots." Because of this system, Field has fast-forwarded the advancement of robotic bin-picking. As stated from the Bloomberg article listed below, "previously, the selection of a single part from a bin full of similar parts arranged in random orientations required skilled programmers to “teach” the robots how to perform the task. 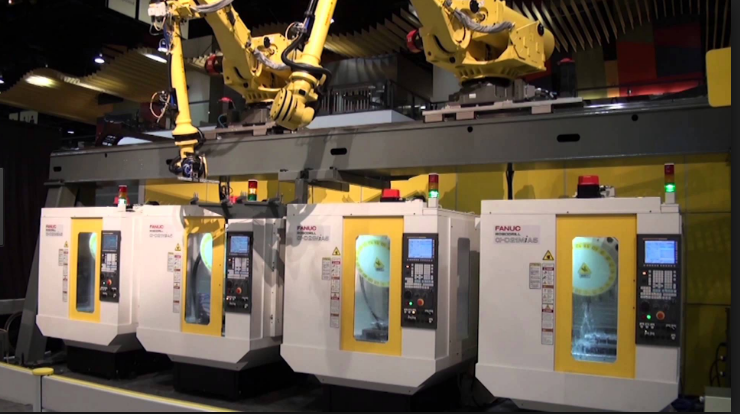 Now, Fanuc’s robots are teaching themselves. “After 1,000 attempts, the robot has a success rate of 60%,” a company release said. “After 5,000 attempts it can already pick up 90% of all parts—without a single line of program code having to be written.”"
To read more about this interesting, brilliant, though economics-changing company, and their amazing robotics, check out this Bloomberg article. I am co-owner of Ware Repair and enjoy working with technology, web design and development, and embedded programming, especially that which applies to robotics. I also enjoy writing blogs and sci-fi novels on my free time.